Oil on copper. 25,5 x 30 cm. The Belgian art historian Georges Hulin has suggested that the painting is French. Like similar smaller-sized portraits of this type, it has previously been attributed to the German Renaissance painter Christoph Amberger, but it is definitely related to portraits from France and Lorraine from around the mid-1500s. The style is reminiscent of works by e.g. the French-Dutch painter Corneille de La Haye (1500/1510-1574), known as Corneille de Lyon. The characteristically expressive bust portraits on monochrome backgrounds often have the same small format and intimate appearance. 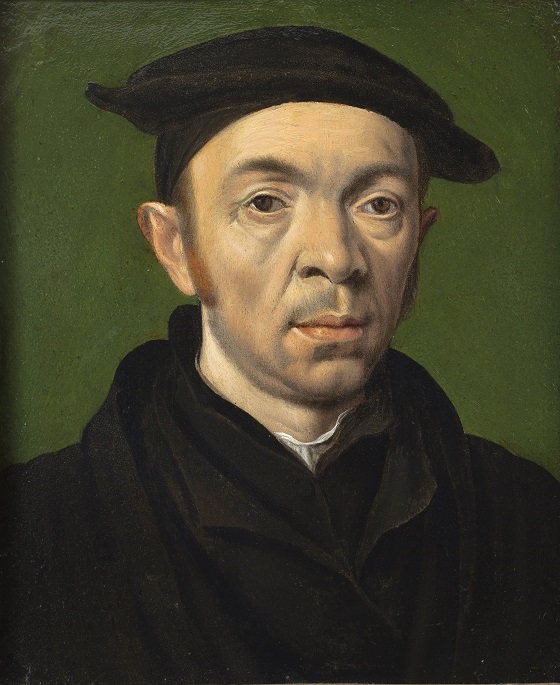 This portrait shows a redheaded man in black clothing and a beret. The style is expressive and marked by great realism, which was typical of the northern European Renaissance. There is no flattering idealism here – the man is cross-eyed and slightly rough in appearance. It is a delicate and highly present portrait full of lifelike details, such as the portrayal of the facial scruff and the wrinkles by his eyes.